2015-05-13 - Aaaaaaand, we're back! I know you guys missed me. 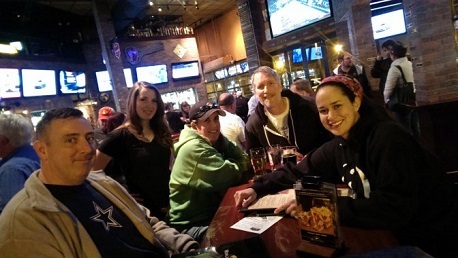 I missed two trivia nights, one of which was probably the most epic of epic trivia nights. (I really wanted to throw another "epic" in there but decided not to completely go overboard) Don't worry, I missed you too. Although, the view from where I was happened to be rather fantastic. I'll post a pic shortly. Despite flying solo, the night seemed to run fairly smoothly and the crowd was certainly rambunctious. Brews Your Daddy edged by the new team of Power & Light to claim second place in the opening game, while Liquid John Mayer Song (reference here) finished at the top of the leaderboard. In the Power Hour, LJMS changed back to their normal name of William Shatnerface and took control of the game. However it was Brews Your Daddy who, with the help of a monster third round, took the top spot and walked out victorious. Don't forget to sign up on the website to make sure you are eligible for the league prize to be handed out in a few more weeks. Make sure you're following us on all the major social networking sites. You'll be glad you did.